This stern warning sign against urinating in public was spotted in Singapore. Can you come up with a funnier caption than me? Leave a comment and let's hear what you got! 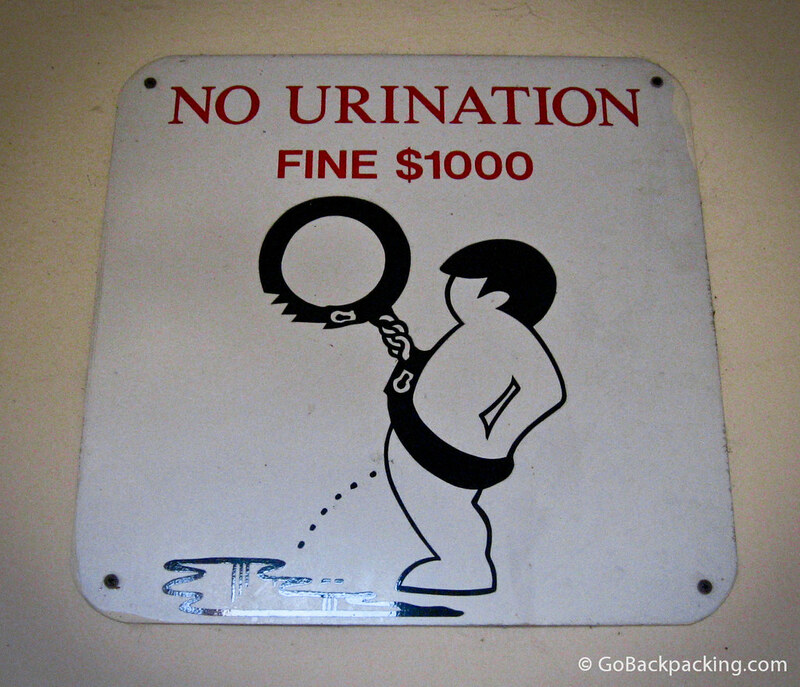 Which is a more effective deterrent, the $1,000 fine or being handcuffed naked mid-pee? Imagine if you were peeing while chewing gum and holding a durian in the subway? The ultimate Singapore crime! That’d be quite an image! Glad nobody dared me to do it while I was there. The only other sign I took a photo of was related to skateboarding. China has good ones, and I can’t wait to see what Japan has to offer. You guys have to know that the signs are put up primarily in Little India in Singapore (and Little India is not little at all, it is quite big). It is also a tourist destination. Thing is, there are many foreign labourers working and living in Singapore. There are also residential flats and commercial buildings in that area. On weekends, they all congregrate in LI and hang out from morning until night, like Woodstock. If you live and work in an office there, you can imagine the stench of urine that wafts through the air on Monday. My friends who live there complain about how filthy the unmanned lobbies or ground floor area are like. This sign may be hilarious to most of you, but hey, if people continue to do the disgusting at your doorstep (literally! ), you’d want them arrested too. Honestly, the residents there would rather have you put durians or stick chewing gum at their doors than pee on it. Thanks for helping to put the signs in context. Public urination will get you arrested, convicted, fined, sentenced to several strokes of the cane and several months of incarceration, and a permanent criminal record.